For decades, alarm bells have been ringing over the human rights abuses that WWF is contributing to in the Congo Basin. In its attempt to defend itself (14 October), WWF shows that it is still deaf to these concerns, and prepared to mislead the public. For example, WWF talks about the “community forests” that have been established in southeast Cameroon, claiming that “each of these are a minimum of 5,000 hectares in size.” That is in fact their maximum size (some are just a few hundred hectares). This might sound inconsequential but, to put it in perspective: for every one hectare of the Baka’s land that has been recognized as a Baka “community forest,” more than 60 hectares have been stolen – with the connivance of WWF – to make a national park or wildlife reserve from which the Baka are being illegally evicted. Not only this: for every one hectare of Baka “community forest,” more than 60 hectares have been dished out to the logging companies that WWF is partnered with and over 150 hectares have been stolen to create trophy-hunting zones. We could point out the other inaccuracies in WWF’s response but it all boils down to one simple question: will WWF make sure that the logging and conservation projects it supports in the Congo Basin have received the proper consent of the indigenous landowners? 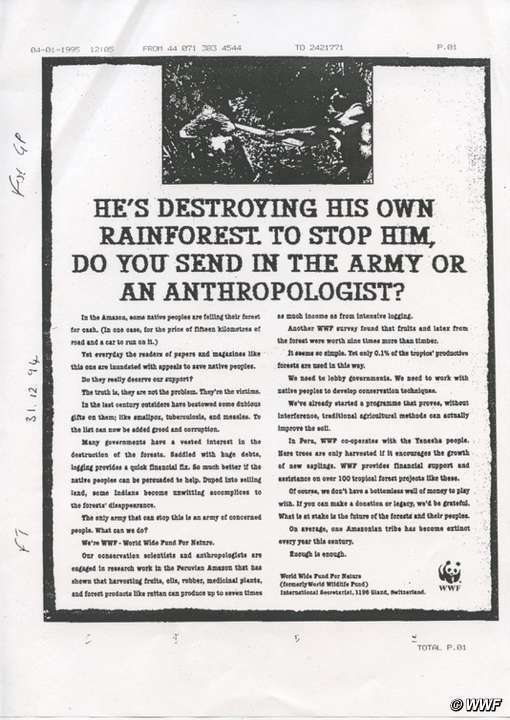 In 1997, WWF committed to doing exactly this with the adoption of a new indigenous rights policy, after it was roundly condemned for publishing a racist, anti-indigenous advert. This policy is in keeping with basic standards of corporate responsibility, like the OECD Guidelines, and international laws like the African Charter. Ten years later, WWF commissioned an independent review which found that the policy wasn’t being followed. WWF published extra guidance, explaining that consent was a “core requirement” that couldn’t be ignored. Today WWF is still ignoring this basic requirement, over 20 years after adopting its policy. It attempts to dodge the question by claiming that it’s the government’s job to obtain consent. That cuts no ice: if the indigenous people haven’t given their consent, then WWF has no business being there. Baka and Bayaka hunter-gatherers from Cameroon, the Central African Republic and Congo describe the abuse they suffer as a result of WWF’s conservation work. WWF then claims that it needs more information, which Survival isn’t providing. Yet as our recent report shows, these abuses have been documented dozens of times: they are widespread and systematic. Independent investigations commissioned by WWF have corroborated our findings. In any case, how much information does WWF need before complying with a “core safeguard requirement” of its own human rights policy? Vague talk of WWF’s “efforts to extend and formalize” consent counts for very little. Until it actually walks the walk, WWF will keep contributing to these grave human rights violations, and to the needless suffering of thousands of people. In September 2017 Survival decided to withdraw from a mediation with WWF. It explains its reasons for doing so here. Tagged Cameroon, Central African Republic, Indigenous Peoples, Republic of Congo, WWF. In support of this article, I have in my Twitter postings referred to the fact that in Cambodia most logging took off from the late 1990s after and despite the major international conservation NGOs opening their offices and programmes there. At first the more accessible timber was harvested, near transport routes, and once that was gone, new roads were built in to previous virgin forests that were home to Cambodian’s indigenous peoples, across the provinces of Kratie; Stung Treng, Ratanakkiri, and last to fall prey Mondulkiiri. Once most trees were exploited, the cleared land was up for grabs, and needless to say, most of it ended up in the hands of people associated with same vested interests as the loggers. For a short while Global Witness (https://www.globalwitness.org/en-gb/campaigns/cambodia/) was engaged to work with the Cambodia government to monitor what was going on and the impact of claimed remedial measures. Their reporting of the facts soon led to their expulsion from the country. Logging and land-grabbing have continued to this day to the point where hardly any of Cambodia’s 200,000 ethnic minorities population is able to lead their traditional lives. persists, that they are unable to express themselves or make proper economic use of their lands. (http://anorthumbrianabroad.blogspot.co.uk/2015/03/more-to-cambodian-culture-than-angkor.html). Just now I am in the UK and watching afternoon TV when many charities are touting for funds with images to invoke pity and guilt. One denotes animals at risk of extinction, unless you send them money. Why do they and their target audience care more about animals than the people who have lived happily and sustain ably alongside them from time immemorial? It’s time for conservation NGOs to explain. Thankyou mr lowrie for enlightening me with your comment. I think survival international is right in making that sentence and it should weigh on the concience of anyone involved with the WWF including sponsers.It must be a continuous perilous situation for SI to gather their data and then get stupid non posative action on this from WWF ,it throws WWF entire operation into negativity i gather these highly knowlegable forest dwellers also move for celebratory meetings and seasonal pursuits and since they do not consider the wheel and mainly travel by foot ( some so they cover their tracks so to not disturb the forest )so its extremely unlikely they would not want to naturaly pass through parks rather than WALK around the barriers! same for the wildlife . Thank you for your response. Indigenous people cover the whole gambit from those who maintain ancient hunter-gatherer lives, like “uncontacted” tribes to ones who have embraced modernity willingly and unwillingly. The real problem is that they are rarely given full choices with “free prior and informed consent” a rarity rather than the norm. Just now there has been a major “wildlife” conference in London with 80 countries present, yet it seems no indigenous people’s representatives are there. Far more effort and money is devoted to protecting endangered animals than to endangered people, who as Survival point out, have lived sustainably in harmony with nature from time immemorial. In Cambodia it is not they but the elite who exploit wildlife whether for their own direct consumption, or for sale and profit, often the same elite “co-operating” with the Conservation NGOs. Global Witness was an exception, sticking to its mandate, and needless to say was kicked out of the country. Strangely though the money keeps rolling in to WWF, WCS, etc. In December 2017 the EU awarded Cambodia-WWF a new grant of US$ 3.3m. That alone is more than the annual budgets of all indigenous people’s organisations combined. In July 2016 the Walt Disney Corporation bought up US$ 2.6m worth of carbon credits (despite doubts about the scheme) the money going in to the coffers of WCS and the government. These are just two grants in the vast portfolios, “won” as I say despite an incontestable record shown by satellite imagery that proves deforestation has escalated since these Conservation NGOs set up shop in Cambodia.